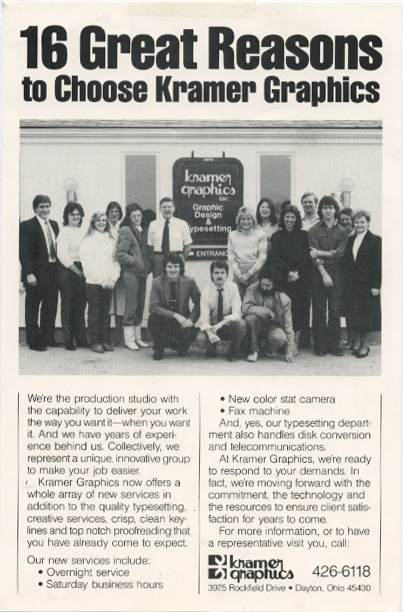 Kramer Graphics began as an art production studio in the basement of founder Mary Lou Kramer’s home in 1976. 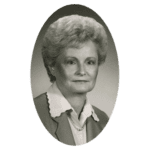 From the beginning, Mary Lou delighted her customers by offering attentive customer service, quick turnaround and state-of-the-art technology. 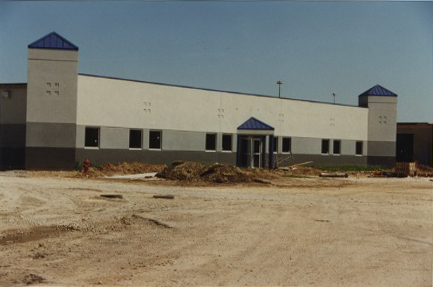 In 1988, Kramer was the first company in the Dayton area to offer digital output from Mac and PC based computers. 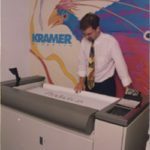 Throughout the 80’s and 90’s, Kramer grew steadily as we consistently pioneered new digital printing technologies that brought higher quality and more cost-effective solutions for our clients’ indoor and outdoor printing projects. 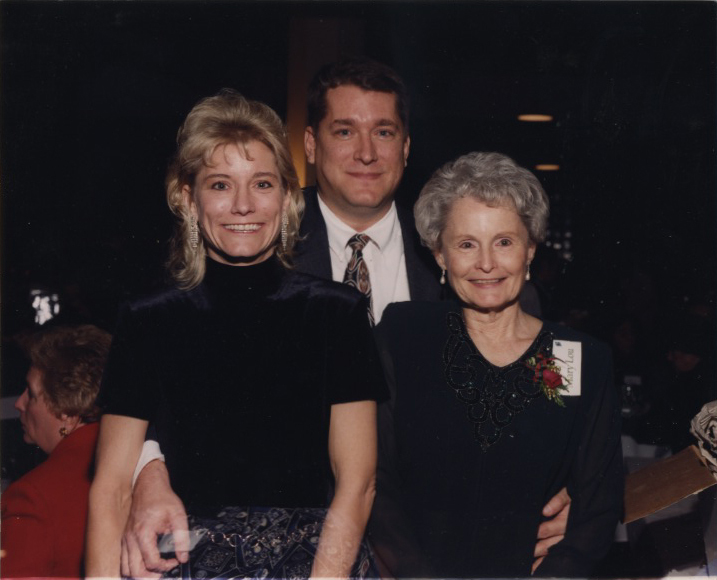 Today, Kramer Graphics is led by Mary Lou’s son and daughter, John and Kelley. Kramer Graphics occupies a 70,000 square foot facility in Dayton, Ohio. Kramer Graphics has more than 80 professionals with a combined experience of over 700 years! For a more detailed timeline, please look below! 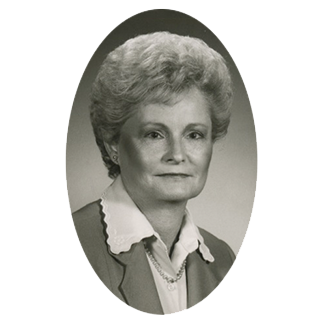 Mary Lou Kramer starts Kramer Graphics in the family basement. At this point, offering typesetting and art services. Mary Lou’s husband serves as the delivery driver. Delivering Mary Lou’s work before and after his daywork as a carpenter. 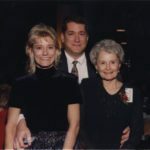 John and Kelley join Kramer Graphics. 8 employees. ​Kramer Graphics begins working on 1st and 2nd shifts. 14 employees are on staff. 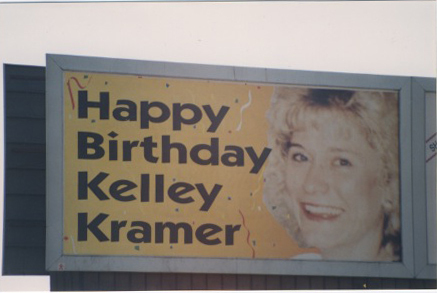 The picture below is advertisement Kramer Graphics did back in 1986. Mary Lou retires, John and Kelley (brother and sister) become president and vice-president. 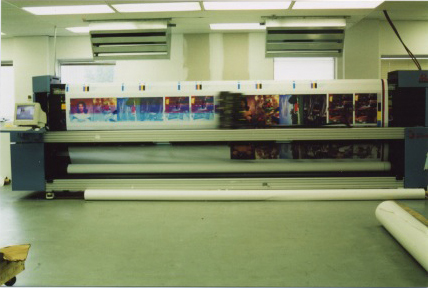 Kramer Graphics was one of four print shops in the United States to offer an economical digital printing solution of enlarging an image up to 42″ x 30″. 27 employees. Kramer Graphics begins printing vinyl banners, fabric banners, mounted posters, and decals. Kramer Graphics moves to a new building with 17,000 sq ft. This is the fifth move since its inception. For the first time in its history, Kramer Graphics now has a 3rd shift and is in operation 24/7. 48 employees on staff. Kramer Graphics enters the outdoor market . 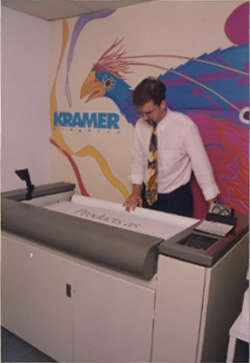 Kramer Graphics was one of the first 5 printers in the country to offer solvent digital printing on wet strength paper. 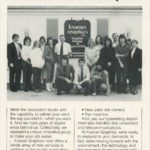 The company has now reached 54 employees. Purchased digital die cutting equipment and expand production facility square footage. Expands production facility by adding more grand format presses. 60 employees are on staff. Entered the transit market. Began producing bus shelters and taxi toppers. Purchased first flatbed UV press that allowed direct to substrate on rigid materials. Several types of mesh are added to product line. Introduced reflective billboard products for outdoor applications. Kramer purchases gopher press which is a solvent ink grand format press. Kramer Graphics becomes the official digital printer of the WGI world championships. Purchased the Firebird press which is a “green” press as it uses water-based inks. Online ordering (MOI) is launched. Kramer purchases first white ink capability presses. Today, these are known as Kramer’s Polar Bear and Cub. Kramer Graphics purchases a dual air welder. The new welder allows us to finish vinyl much quicker. Introduced a neon product line for outdoor applications. 65 employees are now on staff. The Grizzly press is purchased that includes a hybrid 126” roll to roll or 8’x 126” flatbed, as well as 8cp press with white ink capabilities. The transformer is purchased, allowing us to finish PE posters faster. The transformer can finish all PE types including the 2 pocket system. The company now has 72 employees.